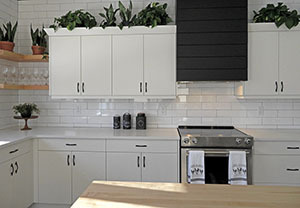 Miller’s Casework designs and manufactures Tennessee’s most durable and beautiful melamine and high-pressure decorative laminate (HPDL) cabinetry. We specialize in European-style frameless cabinets, which emphasize clean, seamless style and complete, easy access. Whether you need simple, traditional cabinets for your office or whether you want fully customized, distinctive storage solutions for a chain of retail spaces, Miller’s Casework has the skilled technicians and resources to help you achieve it. Call us today at (931) 739-9292 to receive a free, no-obligation quote. Unlike some large-volume cabinet factories, where options are limited and quality control and consistency are dubious at best, at Miller’s Casework you get our undivided attention and personalized frameless cabinetry solutions. At Miller’s, we employ professional millworkers who are experts at designing, engineering, manufacturing, and installing our beautiful cabinets. All work is completed on-site at our warehouse in Sparta, where project managers can oversee even the smallest details. Your order can be adjusted in real-time. You call us, and we make the changes – no middle-man to delay the process. This includes adding more pieces to your order or making design changes (at certain points). Our customers have constant access to project updates. 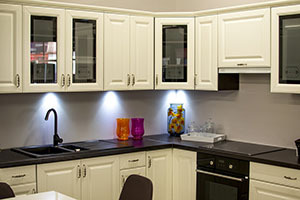 Anytime you call, we can tell you where in the production process your cabinets are and much more. Frameless Cabinets With The Look You Want! Other customizations like veneers, plywood cores, finished interiors, etc. We take very seriously our mission to provide our clients with high-quality, beautiful, enduring frameless cabinetry. Call us today at (931) 739-9292 to experience the next level of customer care! This entry was posted on Tuesday, March 26th, 2019 at 5:10 am	and is filed under Uncategorized. You can follow any responses to this entry through the RSS 2.0 feed. Both comments and pings are currently closed.